There was some good food to be had at Yellow Dog Eats Café on my recent visit there, but unfortunately it really didn't end up on my plate but on that of my friend, Tommy. Extremely salty soup and a messy sandwich with cold pulled pork left me sorely disappointed. But, let's start with the good. We arrived about 5 or so on a Sunday evening. Yellow Dog Eats Café is a very interesting place, quite unique. You order at the counter and find your own seat. There is plenty of seating, inside and out and it's quite quaint. We approached the counter and the friendly girl there asked if we'd been there before. Our answer was "no" and so she proceeded to tell us about the place. Maybe it was me, but she's done this once to often and needed to slow down a bit. But, we did catch a good part of what she had to say. Eventually we returned and ordered. Tommy ordered the Holy Crap. This was mesquite grilled turkey on a dark bread, maybe pumpernickel, with bacon, lettuce, onions and cheese. It was very good and was definitely the best bite to eat I had. It was served with a coleslaw that was quite a surprise--a surprise because it was very spicy hot! It was a good coleslaw with a few craisins in it to give some sweetness, but it had a very definite heat as well, not for the faint of heart. My meal was not so satisfying. 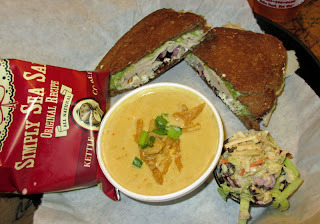 When I was ordering, i saw "beer chees [sic]" on the chalk board and so I ordered the Beer Cheese Soup. Unfortunately, I could barely taste any beer or cheese--all i could taste was salt. I'll bet the chef or cook never tasted that soup. If they had, they would not have served it. I ate quite a bit of it, hoping with each sip I'd taste something other than salt, but no luck. I would never serve anything like that. 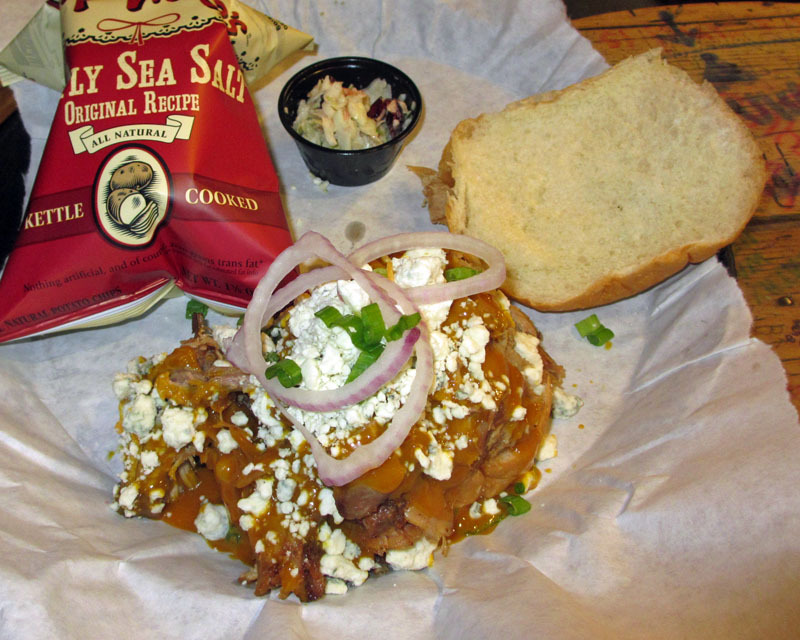 The sandwich I ordered was the Blue Suede Shoes, billed as "smooth pulled pork topped with tangy bleu cheese, crispy bacon, thin sliced scallions, and red onions served on a soft bun." According to the menu, "this would make Elvis proud." I disagree. This would have had Elvis left wanting warm pulled pork and a huge handful of napkins. The botttom bun was placed on the plate, then cold pulled pork--not even warm-- was put on, then the other ingredients and a dose of BBQ sauce (admittedly a good sauce)--and it was the only warm thing. Unfortunately, it made it way under the bun and made for a very messy sandwich. I used a ton of napkins. The because the pulled pork was cold, it was hard to judge its flavor, but it seemed OK. However, the blue cheese was too much and overpowered the sandwich. I would not order this again. So, I entered Yellow Dog Eats hopeful based on all the good reviews I'd read. Even a good place can have a bad day--and a bad place have a good day. I'm hoping this was just their bad day because nothing I was served would entice me to return for a second visit. Be your own judge, but my experience was that this place did not at all live up to the hype. 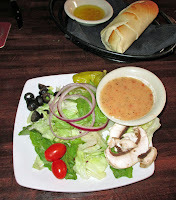 We had a very nice meal on a recent Friday night at Pannullo's Italian Restaurant in Winter Park. We first stopped by for a glass of wine on the Sidewalk on a beautiful Friday afternoon. But after walking up and down Park Avenue in search of someplace good to eat, we returned here as the menu and ambience were the most inviting we saw--we were not disappointed. We started off with some wine and began our meal with an appetizer of Cheese Triangles: lightly breaded and fried mozzarella, muenster, and provolone cheeses, served with a marinara sauce. They were delicious and the marinara was excellent, one of the best I've ever had. It was a good way to begin. We started dinner with salads and bread. The House Salad was an excellent mix of lettuce, olives, a few grape tomatoes, some mushrooms, red onions, a pepperoncini, and a house Italian dressing. The salad was fresh and flavorful and sure hit the spot. The bread was very soft and still warm, served with some olive oil and garlic--there may have been a touch of clarified butter in there as well. But it was very good and was also slightly warmed, a nice touch. For his meal, Tommy ordered the Fettucini Alfredo with blackened Chicken. It was very, very good. 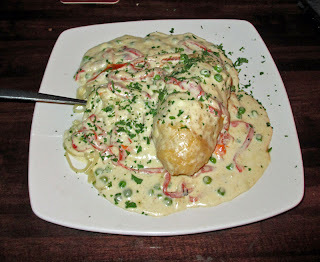 The Fettucini Alfredo was nice and cream and rich and had a huge cheese flavor. 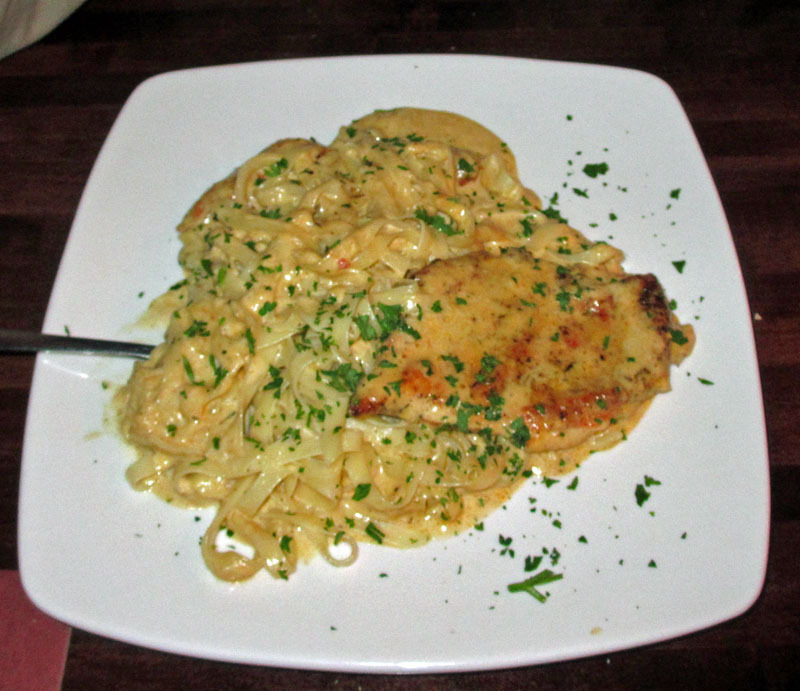 The blackened chicken was cooked perfectly and the spiciness of the blackening added a nice contrast to the creamy and smooth cheese flavors of the Alfredo sauce. Besides the huge flavor, it was also a huge portion, and we had a nice to-go to enjoy at home another time. For my entree I had the Chicken Gorgonzolla, a fair-sized breast of chicken that was stuffed with pepperoni and gorgonzola cheese, then served in a roasted red pepper gorgonzola sauce on a bed of fettucini. I loved this dish. the gorgonzola was not overpowering, but was very subtle. The roasted red peppers added a wonderful gentle heat, and the pepperoni added a spicy surprise to the chicken. As with Tommy's portion, this was huge, and I left with a substantial portion to enjoy at home at a later time. When we first arrived at Pannullo's (the second time, that is), it was not very busy, but was also early on a Friday evening. But by the time we left, it was quite busy. We sat outside on the porch, right along the sidewalk (where there were other tables). The space had some overhead radiant heaters which took the chill off the Fall evening air. It was a beautiful night and great to eat outside. Our waitress, Steph, was efficient, friendly, knowledgeable, and fast, and provided good service. We really enjoyed our meal here. It was an excellent choice and a fine dining experience on Park Avenue in Winter Park. We had a delightful dinner at La Sirena Gorda Cabaña the other night. The food was excellent, the atmosphere and ambience suberb, and the service spot-on. If I could have, I'd have eaten even more, but we left stuffed and happy, for sure, not even room for dessert--maybe next time. 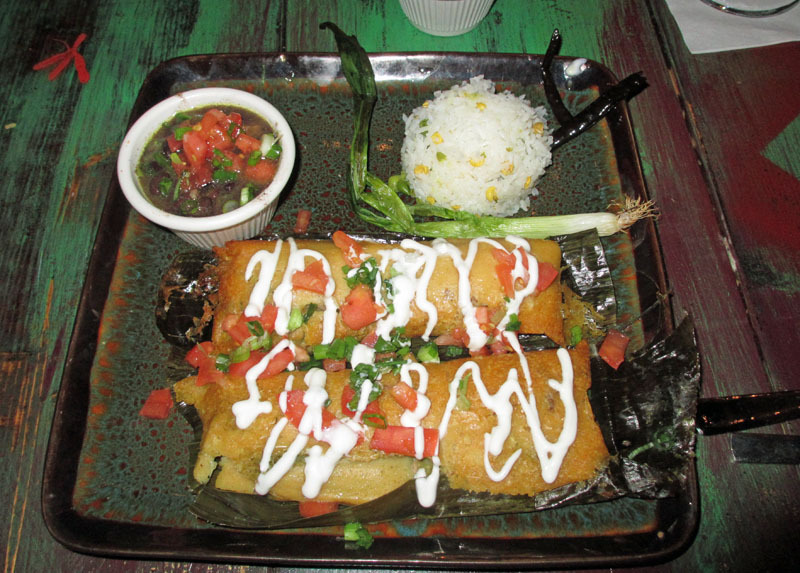 La Sirena Gorda Cabaña is a new Mexican restaurant in downtown Sanford, just off of historic First Street. The dining room itself is beautifully decorated with warm and inviting colors and decor. But what sets it apart form the rest is the outdoor area with both a patio and lawn seating in a nice open space, well lit and decorate. When we were there, they had live music and we've enjoyed the live music previously as well. It really is a nice space for dinner, for appetizers, or just for a few drinks with friends. We are friends with owners Sherri and Lauren, and they were happy to see us again. We've been by a few times now for drinks and appetizers, but finally decided to give the food a try by having a meal. We were not at all disappointed, it was very, very good. We started out with some drinks and chips and salsa. But then we got down to business. For my dinner I ordered the Tamales Chilangos with chicken. OMG! The tamale itself (there were two of them), the corn, was very moist and tender, not at all dry, and had a nice corn flavor. They had been steamed to perfection and were served over what I assume was a banana leaf, a nice presentation. The Spanish Rice was not the normal saffron rice you see everywhere, but was instead white rice with hints of corn and peas and onion and other flavors that made it very tasty. I had the black beans to go with and found them perfect when mixed with the rice. I've never been to Mexico, but I think this is what food in Mexico must taste like, and it was wonderful. 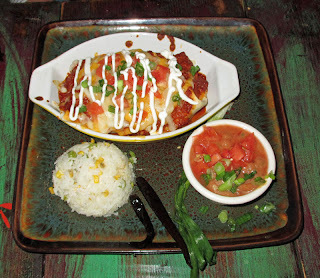 Tommy had the Burrito Mojado, a flour tortilla stuffed with shredded beef, chiles, Mexican cheeses, lettuce, and tomato, then baked with an enchilada sauce and smothered with cheeses and sour cream. It was everything a real burrito should be, extremely moist and tender inside with a nice gentle heat from the chiles. The refried beans were a nice complement to the Spanish Rice and were not the typical, pasty fare you find most places--these were really homemade refried beans and were wonderful. I may be a bit biased because we are friends with Sherri and Lauren (and much of the staff) and have known them for some time, but I really was impressed with the quality of the food, service, and atmosphere at La Sirena Gorda Cabaña. I think Sanford and the central Florida area has a real keeper here, a gem of a restaurant and a welcome addition to the food scene in the Sanford area. I know we'll be back for sure, sooner rather than later, and not just for drinks with friends--I'm left wanting more of that real authentic Mexican fare. Yumm! But, I encourage you to go there, give it a try, and let me know what you think. I think you'll enjoy your experience, start to finish.